How can VOCs affect human health? With our Kryptonite Travel Bottles Extended Vacation Pack, customers will receive six 2oz bottles of our Kryptonite Original Formula glass and bong cleaner. Whether you’re traveling by land, air or sea, these bottles will keep all of your cannabis smoking accessories as clean as the day you bought them. We’ve all gone on vacation and bought a pipe just for the trip only to leave it behind because of the fear that surrounds traveling with dirty glass pipe that wreaks of cannabis. Kryptonite’s special formula will remove all of the unwanted smell left behind from smoking cannabis, leaving your new glass pipe looking and smelling better than the day you brought it home. Are you planning to do a little smoking while you’re on vacation? Kryptonite has you covered! 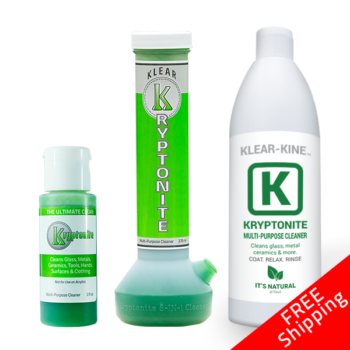 Bring Kryptonite Original Formula glass and bong cleaner in our 2oz travel size bottles on vacation for all of your on-the-go cannabis cleaning needs. Let’s face it. We’ve all gone on vacation and bought a glass pipe just for the trip and usually end up leaving it behind. Our Extended Vacation Pack gives you enough bottles of our 2oz Kryptonite Original Formula Cleaner so you’ll never have to worry about cleaning your glass pipe or bong you bought on vacation again. Gone are the days when you worry about leaving tar, resin or the smell that lingers after cleaning your heady glass at your Mother In-Laws. No longer will you have fret about whether you think you’ve cleaned your glass pipe good enough to remove all the smell from it or the area you’ve cleaned it in while on vacation. Our scientifically engineered formula cuts through the toughest tar, resins, and other sticky goodness left behind on your glass pipe after you’ve used it. Our Klear Kryptonite Original Bong Cleaner formula is not just for your water pipe. Use Kryptonite glass and bong cleaner on your favorite hand pipe, oil rig, extraction tubes, and other hard glass surfaces. Klear Kryptonite also works on dab rags, shirts, jeans, and other cloth material to remove unwanted stains from dabbing, pen marks, and other canna-related stains. Still waiting to be impressed? Complete cannabis care in a reusable, made in America, plastic water pipe. Not only is Kryptonite the lowest VOC cannabis cleaner on the market today (<3% VOC) compared to Alcohol and Acetone which is 100% VOC. Kryptonite is also the only cleaner that passed Colorado Health and Safety Board’s tests and is used by dispensaries all over the United States to clean their displays and cannabis curing jars because Kryptonite glass and bong cleaner doesn’t leave behind chemical residues like alcohol does. Prefer to use salt and alcohol? No problem! Kryptonite has you covered. Use Kryptonite to clean the salt, alcohol, tar, resin, and odors out of your sink, hands, clothes, countertops and dab rags. Alcohol still leaves that been musky smell; but with just a few drops of Kryptonite glass and bong cleaner will restore your piece to its original shine. Dab much? No problem! Kryptonite works great on wax, saps, resins, and other sticky cannabis goodness. Grow much? No problem! Kryptonite works fantastic on cannabis grow trays, scissors, and hands. Dirty dab rag got you down? Try a few drops of Kryptonite cannabis cleaner and warm water. Kryptonite Cannabis Cleaner is the only complete cannabis care cleaner in a reusable water pipe bottle. Pick yours up today at a local smoke shop or order yours online NOW. Klear Kryptonite Original Bong Cleaner has been voted the best glass and bong cleaner in Colorado and one of the best cleaners in the nation. It clean pipes, bongs, extraction tubes, dab rigs, clothing and hard glass and metal surfaces with ease. It helps protect your investment and provides complete care for the pieces you love. When cleaning your cannabis accessories, there’s no need to recklessly shake delicate glass and ceramic pieces or subject them to abrasive materials. 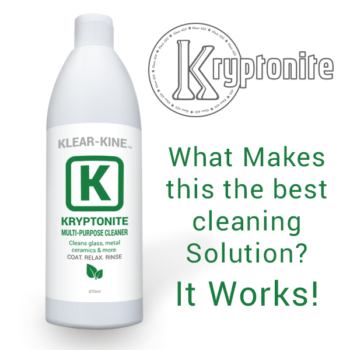 All of our Kryptonite products (Original Formula, Naked Formula, and Extractor Cleaner) have been scientifically formulated in a lab and contain no harsh chemicals or abrasives. We did this in order to create a safe, easy and effective cannabis cleaner that gets the job done without all the damage that other cannabis cleaners on the market cause. Copyright 2017 Klear Solutions Inc.